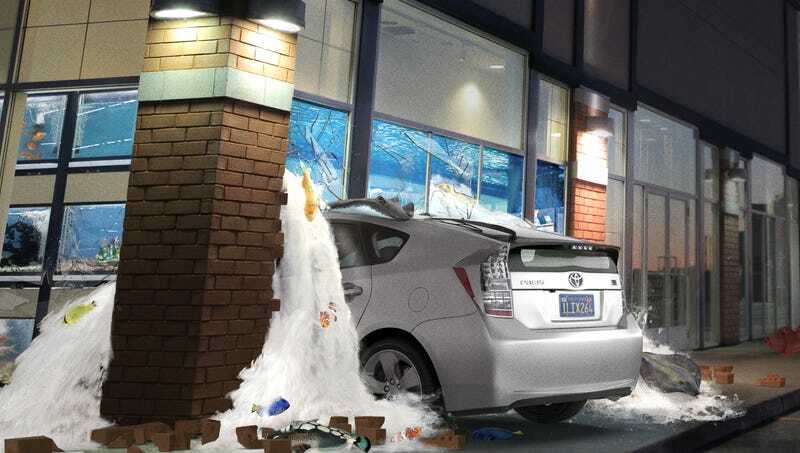 ATHENS, OH—According to a three-year study published Friday by researchers at the University of Ohio, the first warning sign of alcoholism is usually driving over a curb, plowing through a fire hydrant, and crashing into an oversized aquarium. “That data strongly suggest that the earliest indication you may have a dependence on alcohol is when your car lurches onto the sidewalk, goes flying through the plate glass window of a pet store, and comes to a rest sticking halfway out of a shattered fish tank,” said lead researcher Brian Towsen, adding that most participants in the study first acknowledged they might have a drinking problem while watching gallons of water and aquarium rocks pour in through their car’s broken windshield. “In the majority of cases, subjects still remained unaware of their alcohol abuse even as they burst through the wooden exit arm of a parking garage at full speed and flipped their car on a concrete barricade—but by the time they were peeling sea urchins off of their shirts while floating in a 1,000-gallon saltwater habitat with angel fish circling their feet, almost 90 percent had made a decision to seek help.” The study also found that the first sign of a cocaine addiction was usually breaking both legs while attempting to leap from a third-story balcony into a jacuzzi during a hotel party.